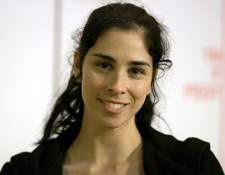 Sarah Kate Silverman is a comedienne who replaced Kath Soucie as the voice of Fry's ex-girlfriend Michelle in Futurama, starting with the episode "The Cryonic Woman" (Soucie voiced Michelle on "Space Pilot 3000"). Silverman is better known for her career in stand-up comedy where she tackles on subjects such as racism, AIDS, homosexuality, poop, and other taboo subject matter. She was previously the girlfriend of talk show host Jimmy Kimmel and she made a notable music video for a guest spot in Jimmy Kimmel Live! entitled "I'm F**king Matt Damon". Silverman was a writer and cast member of NBC's long-running sketch show, Saturday Night Live for 18 weeks during the show's 19th season (1993-1994), but rarely got any screentime, and was fired by Lorne Michaels via fax machine during the summer of 1994. Despite this, she did make a mark on the show with her celebrity impressions of Cher, Marisa Tomei, and Natalie Merchant, and returned to host the show during its landmark 40th season. She was also creator, executive producer, and star of her self-titled sitcom on Comedy Central, The Sarah Silverman Program. On Matt Groening's other animated sitcom, The Simpsons, Silverman voices Nikki, a fourth grade girl who switches between loving Bart and hating him, as seen in the episodes, "Stealing First Base" and "Moonshine River." Currently, Silverman provides voicework on the FOX animated sitcom Bob's Burgers as clingy Pesto brother, Ollie (Ollie's twin brother, Andy, is voiced by Sarah Silverman's sister, Laura). This page was last edited on 13 November 2017, at 02:29.